Back from an energy sapping but riveting four days at London Screenwriters’ Festival, I settled down to the working week and the chores and joys of clearing the inbox. The beautiful short film, Moments, directed by Chris Cronin and produced by Andrew Oldbury and Phil Meacham with Mike Clarke as Executive Producer was definitely one of the joys and a brilliant reminder of why I began screenwriting in the first place – the power of pictures alone to tell a story. In Director Chris Cronin’s own words, Moments is “a love letter to all those Disney classics that used dance to express powerful emotions that simply couldn’t be described by words alone.” From the moment the first dancer flies across the screen, you’re swept up in that perpetually sunlit, magical world where all Disney stories live. Love is not only all around us but makes us want to leap and dance just like Cronin’s leading man, hapless Joel, played by an engaging Simon Hardwick, who keeps missing out on love and even unwittingly sabotaging the feel good factor for everyone else. It’s skilfully paced and plotted, with charming, funny scenes and there’s the feel of a potential feature film here. There’s comedy and pathos and Simon Hardwick hits just the right note in his search for love and Madeleine, the girl he keeps missing while Lauren Harvey plays Madeleine with a humour and gentleness that complements Simon Hardwick’s mixture of wistfulness and gung ho enthusiasm. 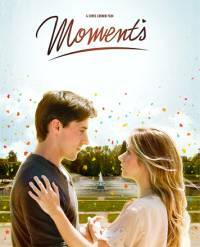 “Moments” is currently screening at film festivals around the world, but do look out for it in the future once it’s released for public viewing. It’s most recently won Runner-up in the short film category at Screen Stockport Short Film and Television Festival, UK. “Moments” was shot over three days with cast and crew drawn from all over Britain and shows what fantastic talent we’ve got in the UK. And one last word, before I get back to my inbox – this is a writer’s blog after all, so I can’t finish without mentioning – Chris Cronin for story and Joanne Gardner and Tina A. Wake for screenplay.